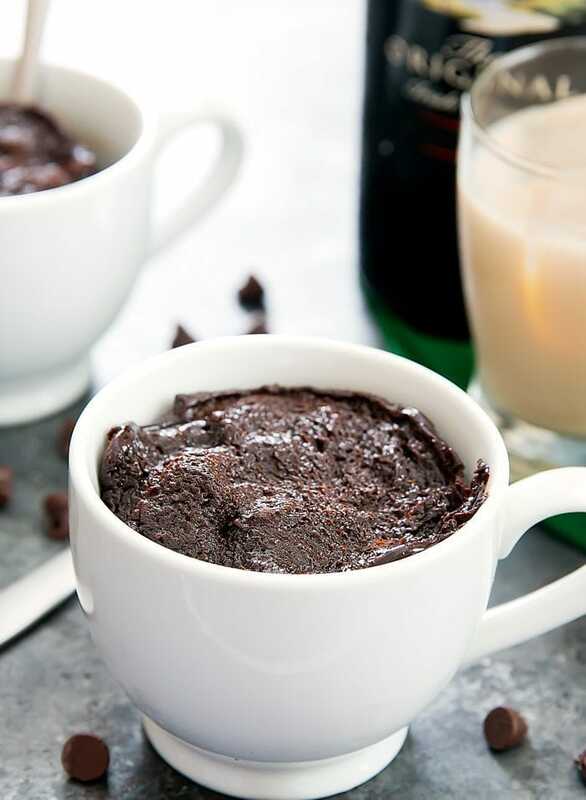 A single serving flourless chocolate mug cake flavored with Baileys irish cream liqueur. 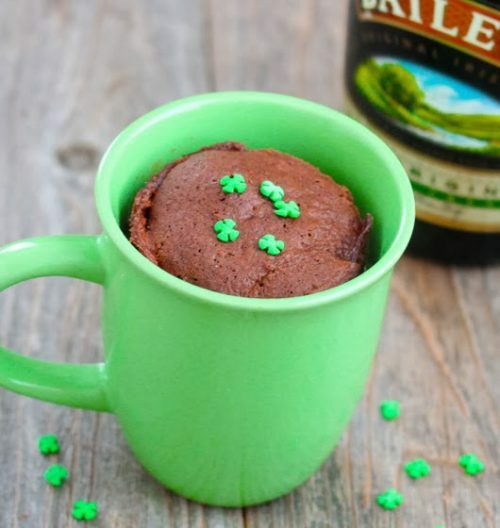 This quick and easy treat cooks in the microwave in just one minute and is perfect for St. Patrick’s Day. 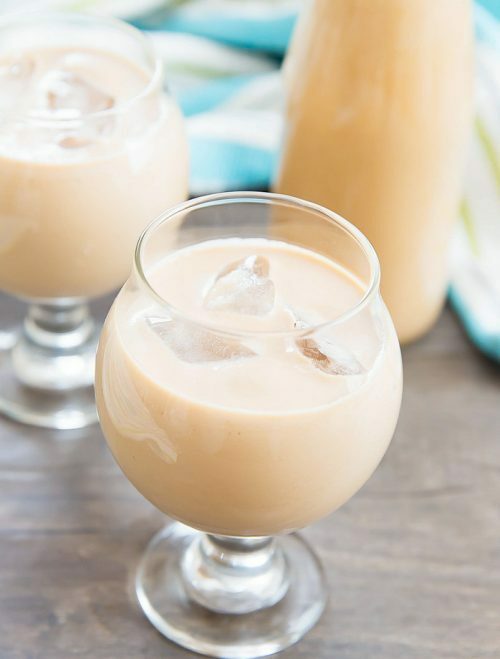 I had all these plans for making a Baileys Irish Cream flavored dessert this weekend. And then Daylight Savings happened. And taxes happened. And all I really had time to do was drink a lot of Baileys. I may have actually finished the bottle (there wasn’t that much left when I started! ), but luckily I can make my own homemade Irish Cream liqueur if I need more later this week. 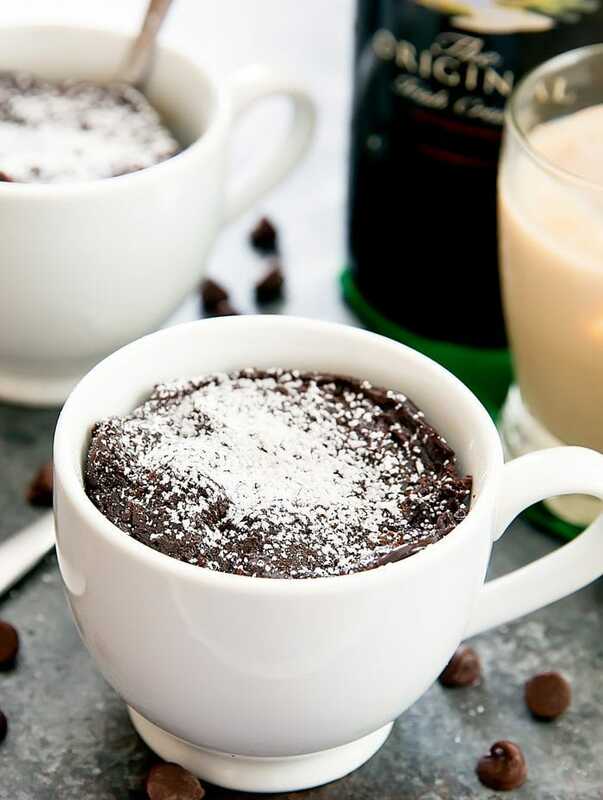 But I did manage to whip up this flourless Baileys chocolate mug cake. 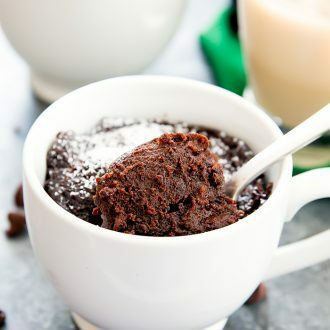 I played around with my flourless chocolate mug cake and tweaked it to make a slightly boozy Baileys version. It looked a little plain, so I added a dusting of powdered sugar on top. This cake has a rich, bittersweet chocolate flavor with just a hint of Irish Cream liqueur. 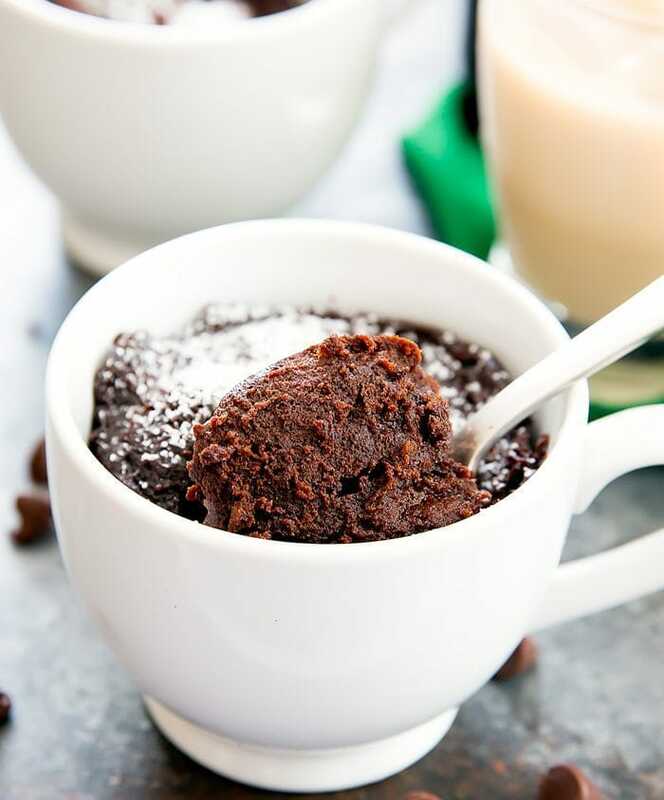 Flourless chocolate mug cake flavored with Baileys Irish Cream Liqueur. Perfect for St. Patrick's Day! 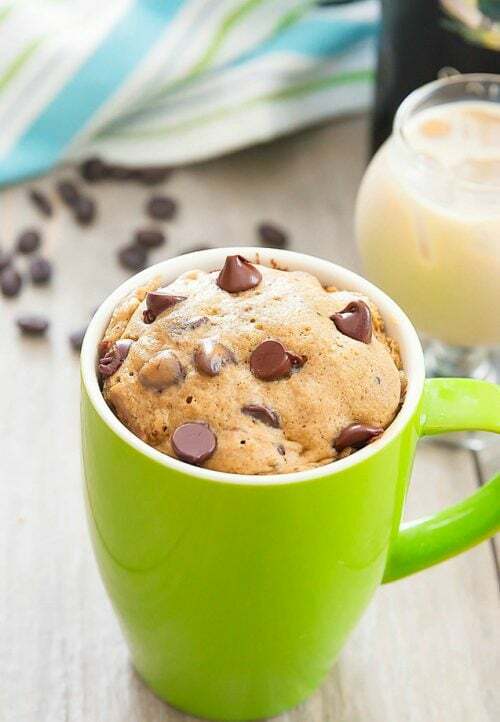 In a large, microwave safe mug, add chocolate chips and vegetable oil. Heat in the microwave for about 40 seconds until chips are semi-melted. 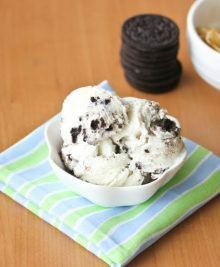 Stir with a whisk to completely melt chocolate chips and form a smooth chocolate batter. Add remaining ingredients. Mix with whisk until smooth. Cook in microwave at full power for about 1 minute. The top of the cake should look done with the edges still slightly gooey. 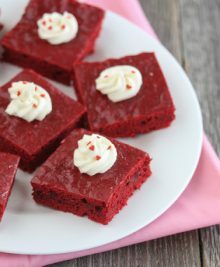 Allow the cake to cool for 5-10 minutes before consuming. When the cake is cooking in the microwave, it will rise very high, but will sink back down considerably once finished. This is normal since this is meant to be a rich flourless cake. 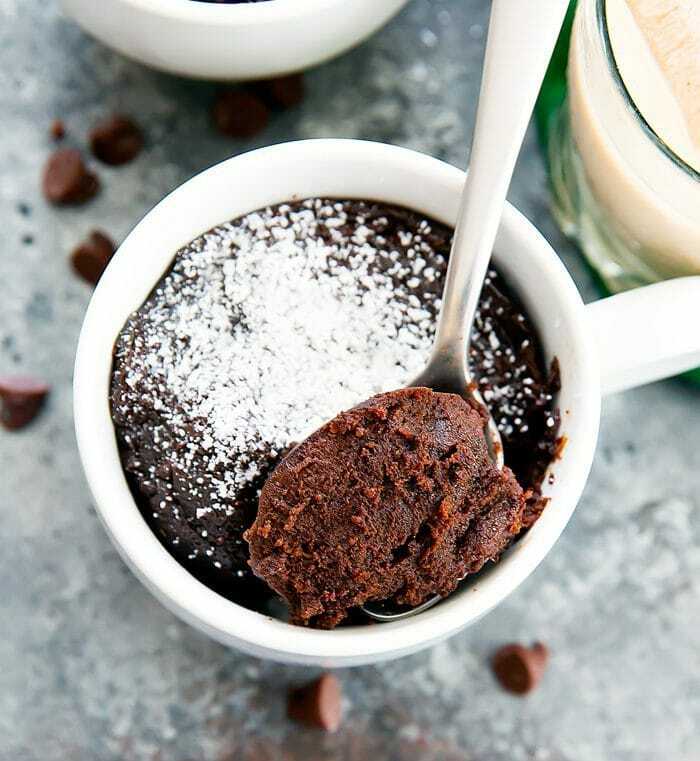 You can plate cake in a smaller mug before serving. I have questions! 1). What size (in ounces) should the mug you bake in be? 2) If you transfer the dessert to a smaller mug for serving, how do you do so without it falling apart.? Thank you! !